Ferguson, MO.—March 12, 2017, about 100 protestors gathered outside of the convenience store Mike Brown visited on August 9, 2014 shortly before he was murdered in cold blood by now former Ferguson cop, Darren Wilson. The protest was sparked by a clip of newly-released video showing Brown at the convenience store the night before his murder. The video was used in a documentary about his murder, titled “Stranger Fruit.” It was featured at the SXSW film festival last month. Before the murder of Mike Brown, the African community in Ferguson, already under military occupation by the police on a daily basis, saw that military occupation quadruple in size with the addition of tanks, troops and martial law after Mike’s murder. 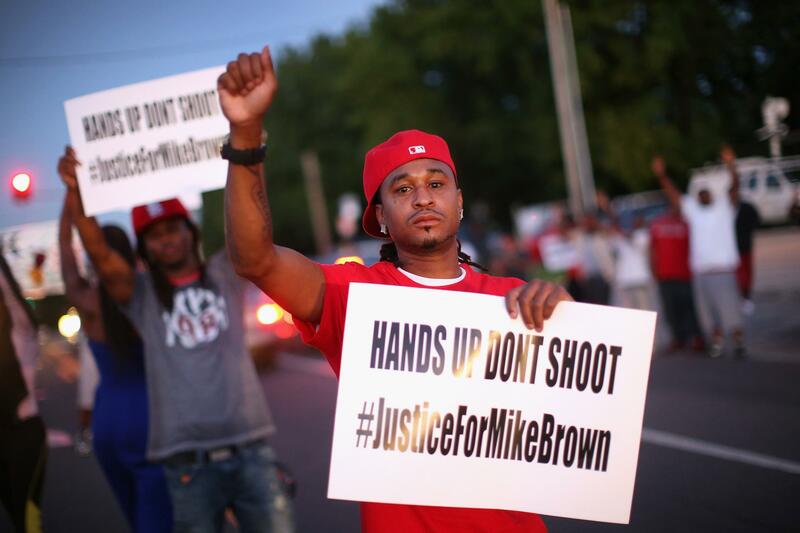 When Wilson killed Brown in 2014, the African working class community in Ferguson rose up and began a historic uprising that sparked the resurgence of the desire for revolutionary change in Africans throughout the U.S. and the world. Africans had not demonstrated this militant resistance since the Black Revolution of the Sixties. It was the African community in Ferguson that was being robbed by the pigs on patrol through arbitrary tickets and fines. The DOJ report also stated that “Ferguson’s law enforcement tactics are shaped by the city’s focus on revenue rather than public safety needs.” When Darren Wilson accosted Mike Brown and his friend Dorian Johnson on Canfield drive, robbery had nothing to do with the encounter. Rather, it was standard colonial policing. The U.S. colonial court system never holds the police accountable when their pigs shoot down Africans in the streets. Despite eyewitness accounts and Dorian Johnson’s video statement on Darren Wilson, who targeted and terrorized the two young African men, on November 24, 2014 a Grand Jury and the Justice Department failed to indict Wilson for the murder of Mike Brown. The ongoing injustice that African people faced in Ferguson prompted the community to hold a Black People’s Grand Jury (BPGJ) under the leadership of the International People’s Democratic Uhuru Movement (InPDUM). On January 4, 2015, the Black People’s Grand Jury voted 11 to 1 to indict former Ferguson cop Darren Wilson for murder in the 1st degree for the shooting and death of Mike Brown. Lead Prosecutor of the BPGJ and Chairman of the African People’s Socialist Party, Omali Yeshitela, along with his team of prosecutors, made clear in his opening statement that black people “can and must take matters into our own hands” following the “no true bill” determination of the St. Louis Grand Jury under Prosecutor Robert McCullough that failed in indict Wilson. Twelve Grand Jurors from the local community were sworn in at the Black Peoples Grand Jury. Residents of Ferguson and greater St. Louis gave testimonies and submitted to cross examination. They told their accounts of police harassment, abuse and murder inflicted upon themselves or their family members by police. Although Darren Wilson and Robert McCullough were subpoenaed to appear at the Black People’s Grand Jury, they did not. Indeed, the Black Peoples Grand Jury already indicted Darren Wilson for the murder of young Mike Brown. This was a clear murder to the African community of Ferguson not withstanding the release of the recent video. We must organize for power over our own lives!